The annual SURFsara Super Day connects science and technology. Learn more about the latest mind-blowing opportunities that high performance computing and data technology can offer you in scientific research. SURFsara supports research and innovation in the Netherlands with advanced and sustainable ICT infrastructure, services and expertise. At our annual Super Day, you can catch up on the latest developments and hear first-hand stories from the scientists who are using our technology and services. Don’t miss this event if you are a researcher from academia or industry, research support manager of a research and/or education institution, academic policy maker, or research & innovation manager in the private sector. 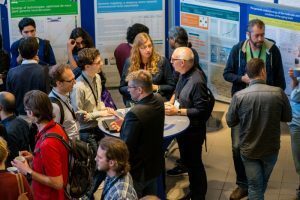 You are very welcome to join the annual SURFsara Super Day where you are immersed in the world of data, high performance computing and ICT innovation for research. Catch up on the latest developments, get inspired by top scientists, and share your knowledge with fellow participants. This entry was posted in Partner, Event.